Planning a trip to Newport? Are you planning to visit our historic Shropshire market town? The Times newspaper placed Newport in it's top 10 of Best Market Towns in Britain review in July 2017. Before you visit to see for yourself, why not download our latest town guide to help you find where to park, where to eat and where to shop. Your pocket guide to finding free parking, free wi-fi, places to eat, drink and shop. You'll also find cash machines, the Post Office, bus stops and so much more, all conveniently packaged in this digital guide. Newport is a fantastic market town, surrounded by beautiful villages and countryside. By buying locally, we can all help to support small local businesses. Download the latest copy of the Newport Town Guide - Digital Edition. Suitable for pc, tablet and smartphone. Complete with town map, displaying free parking, free wi-fi, banks, bus stops and more. 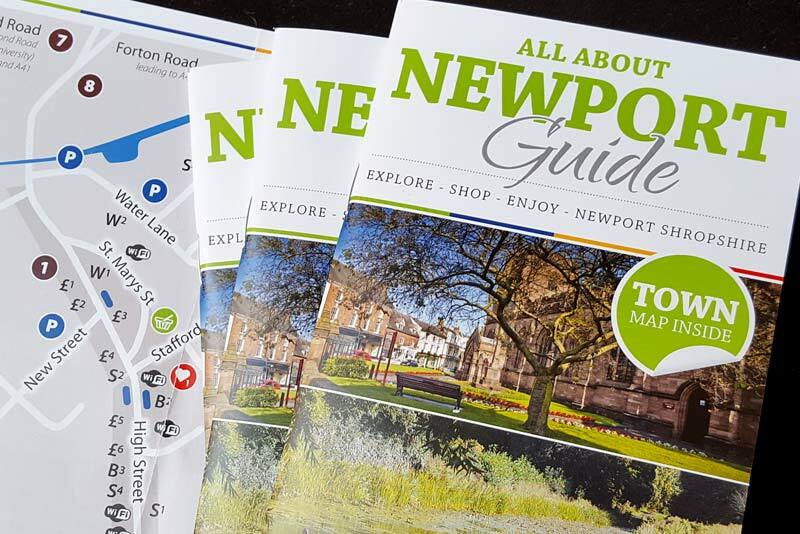 Distributed to businesses, organisations and selected pick-up points in and around Newport, the guide also comes as a digital edition. Available for reading offline or viewing on smartphone while out and about in Newport. Whatever the device, your business message gets placed directly in front of the reader.